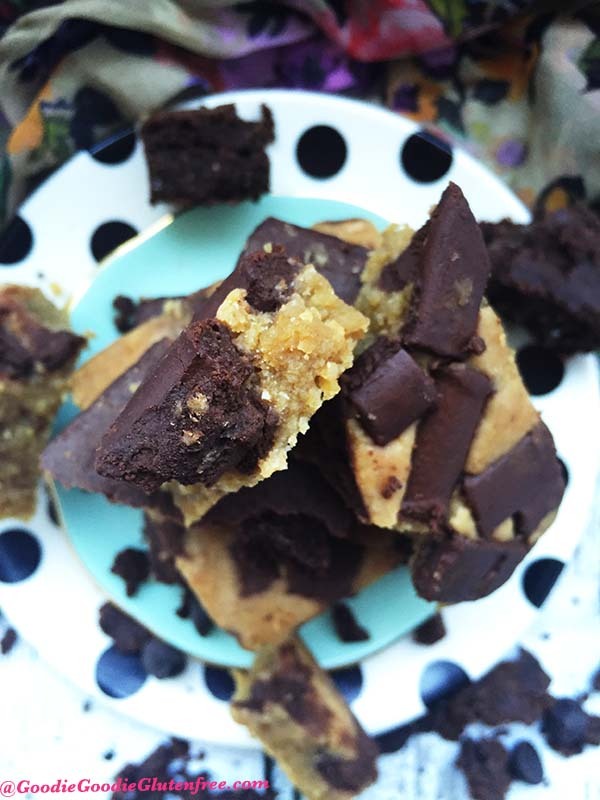 Pure Genius Provisions Brownies and Blondies are the newest Gluten-Free & Vegan dessert on the Health circuit radar that you need to know about! So I wanted to tell you about them because I too am crushing hard on these decadent (but secretly healthy) treats! If you haven’t yet heard of Pure Genius Provisions, I am telling you now – get them on your radar! They have just gotten into Whole Foods and they are going to blow up! So first, this brownie and blondie duo is different from all other brownies because it’s made with BEANS! Yup! Beans! Chickpeas to be exact, but heck you would never know it! Plus it’s made with whole food ingredients which is something I am always down with. No processed additives or fillers. Sans yucky stuff, and only wholesome goodness. This is a brownie for life kinda brownie. This is a blondie for life kinda blondie. They are THAT good. Get a look at those dense, chocolaty brownies & blondies! Can you see how packed they are? It’s a single serving packaged brownie and blondie that doesn’t require hours in the kitchen to bake, make, or clean up. They are gluten-free, nut-free, Vegan, soy-free, dairy-free, kosher and refined sugar-free. And they taste amazing! While I AM an avid baker, it is really nice on the occasion to be able to pick up a packaged wholesome treat that is free of my allergens and acceptable on all the elimination diets I am on. I can’t tell you how many baked treats I have had over the last decade of being gluten-free that taste disgusting. I know I’m not alone when I say I have tasted some pretty nasty gluten-free treats. They definitely exist. But lucky for me, for you and anyone else that tries these blondies and brownies – nasty is definitely NOT on the list. 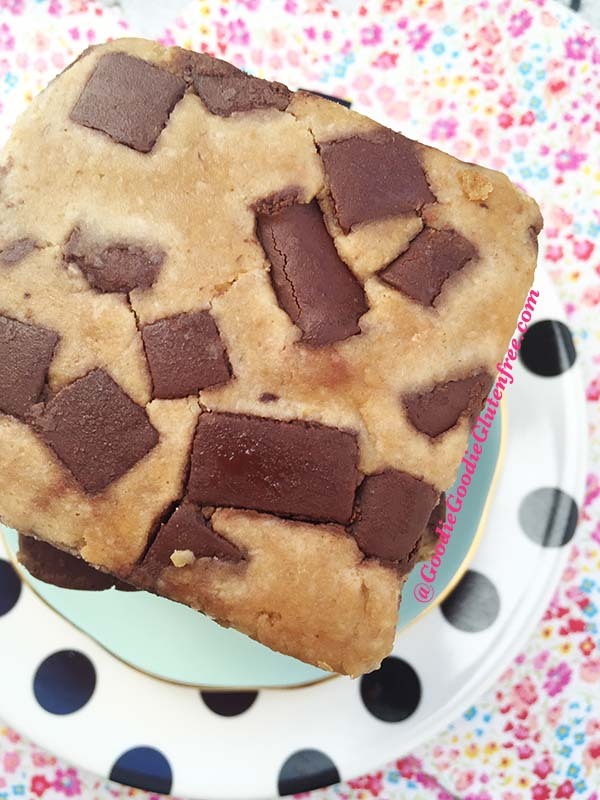 I have nothing but good things to say about these brownies and blondies! I love Pure Genius Provisions and you will too. I get so happy when I eat these brownies and blondies. If you are anything like me, and have been gluten-free for a long time and have many food restrictions then YOU know how hard it is to find a product that fits all your dietary needs and tastes out of this world. 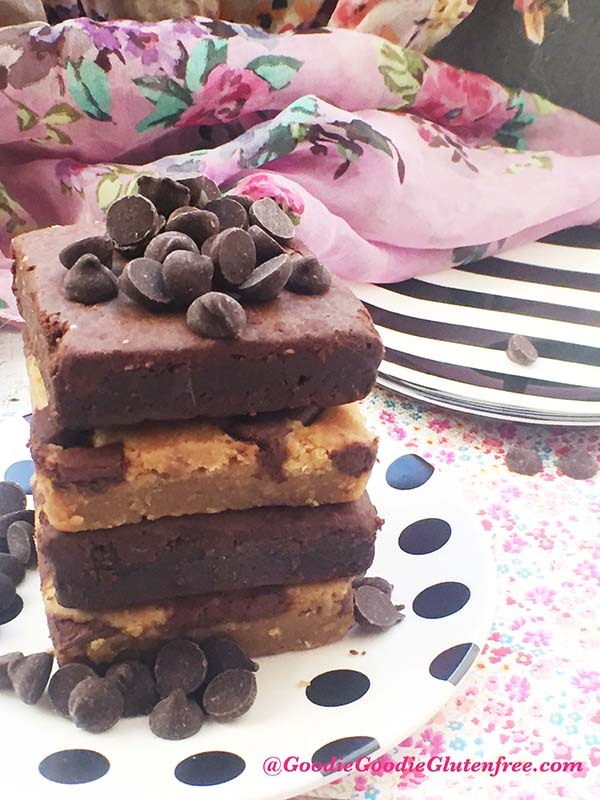 These are the kind of brownies and blondies that are an acceptable day treat and after dinner sweet that won’t pack on the pounds and won’t leave you with a sugar hangover the next day. I can tell you they are kid friendly, or I can tell you the story of my cousin’s young son who couldn’t eat any desserts at our Thanksgiving Dinner because he was allergic to nuts, and his parents were unsure which desserts were safe. I had brought Pure Genius’s brownies and blondies with me so my sister and I could enjoy a gluten-free and low sugar treat, which we devoured 2 on the train ride up to Philly for Thanksgiving, leaving us with 4 leftover for the holiday dinner. And when it came to dessert time, I noticed my cousin’s son sitting dessert out. You see he is allergic to nuts and peanuts. And because his parents didn’t know what the cross contamination status of the desserts were, or if they contained nuts at all, they couldn’t take any chances. Now it’s one thing for me, a 39 year old gal to feel deprived. I’m an adult. I can handle it. But a little kid? No. I just couldn’t take it. And this experience prompted me to hand my stash of chocolate brownies and blondies over to him, so he could enjoy Thanksgiving dessert. He was so excited, he ran over to his mom showing him the stash, eyes all lit up in possibility. She of course said out of concern “Wait! We have to check if these are nut-free”. He was given the green light, and he sat there in pure delight eating these brownies and blondies. This completely tugged at my heart strings, I was so happy to see he was able to enjoy something sweet and decadent without getting sick. And even he, this little boy had NO IDEA there were BEANS in these brownies and blondies! As far as this dessert goes, it’s loaded with nutrients and protein! 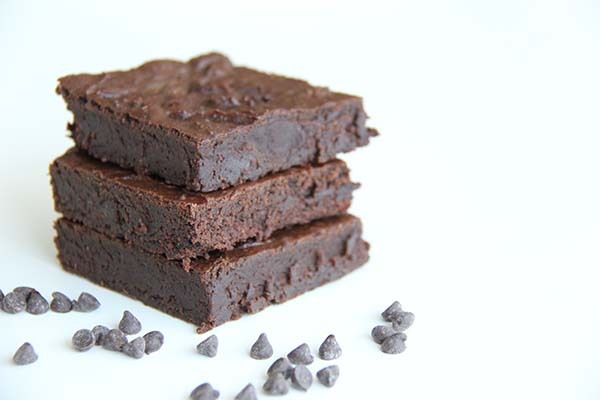 Chickpeas are LOADED with protein, 4 grams per brownie. So you will actually get full fast, and if you are watching the muffin top? Then these are for you! They are also made with less then 9 ingredients. And each ingredient is a whole food. On the back of the ingredient label you will find chickpeas, gluten-free oats, maple syrup, sunflower oil, flax, oregano and sea salt. For the Blondies you will find Enjoy Life (top 8 allergen free) chocolate chunks and for the Deep Chocolate Brownies you will find organic cocoa powder. That’s it! Simple. Easy. Delicious. Wholesome. -These desserts are Certified Gluten-Free and made in an Allergen-Free facility. -They are Vegan, Kosher (Certified by the Orthodox Union), Nut-Free, Certified Organic and soon to be certified Non GMO by the GMO Project. 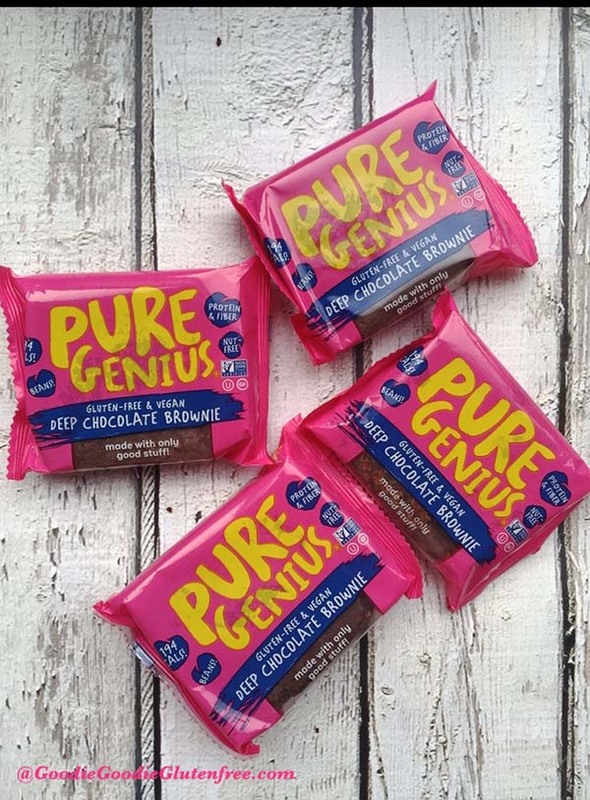 Some of my favorite healthy brands got their start at Whole Foods, so I am really excited Pure Genius Provisions has gotten into select stores. That’s how it starts. And that’s how it also started for Organic Gemini’s Tigernut Milk and Anita’s Creamline Yogurt. I know a good product when I taste it. And the products I love, I passionately promote. Pure Genius Provisions and I are offering a special discount for purchasing these brownies and blondies through their website! Yay! It’s 20% off all purchase through the end of July, 2016 using code GOODIEGOODIEGF (case sensitive) during check-out. And shipping is FREE! Yay! Who doesn’t love a discount?!! So I just so happen to have partnered with Pure Genius Provisions to do a GIVEAWAY! Yay! One lucky reader of mine will be privy to getting a whole box (package of 4) Deep Chocolate Brownies and Chocolate Chip Blondies!!! I’m kinda excited for you guys! You are absolutely going to LOVE these treats!! 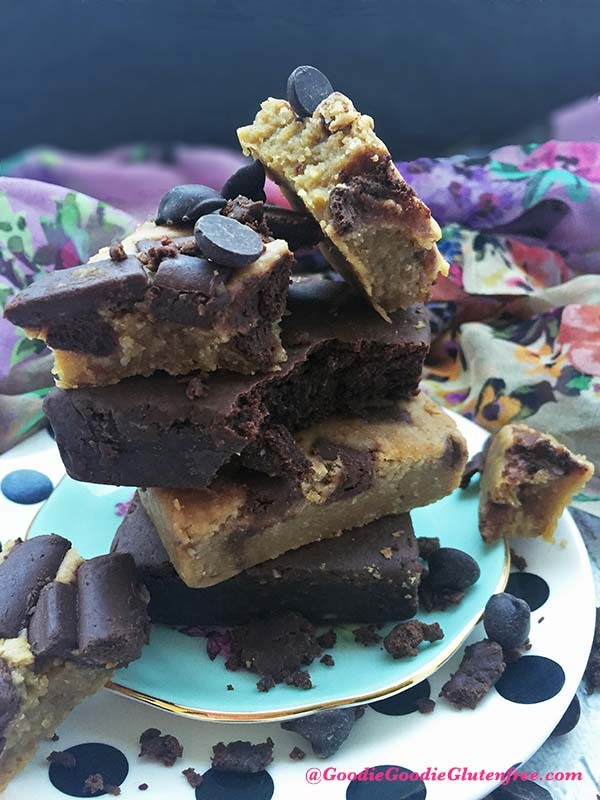 Simply comment below on this post and share 1 reason why you would want to win these brownies and blondies OR simply comment on my Instagram or Facebook (@goodiegoodieglutenfree) giveaway for these desserts. ONE lucky winner will be selected on Friday, July 1st. Love & delicious gluten-free treats! I’d love to win these because I’m gluten-free too 🙂 And it’s so tough to find just the right sweet treat! Just wanted to let you know a winner was chosen on Instagram. But stay tuned, I am doing two more giveaways this Summer for signed by the author cookbooks and they are totally RAD!